Hurry, while you still in your pajamas! Get that bowl of cereal and enjoy the nostalgia of watching Saturday Morning Cartoons. 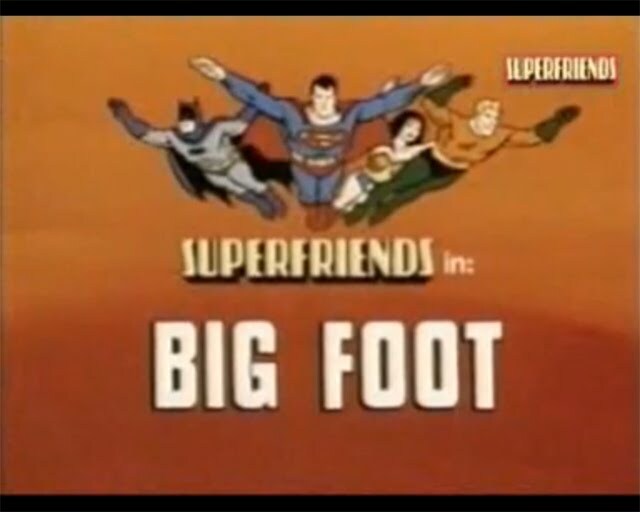 In this case the Superfriends. 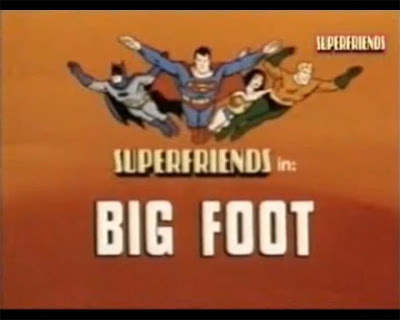 Not only is it fun to watch cartoons from the '80s but the explanation of Bigfoot origins is a surprise mind-boggling ending. The news agency, Wireless Flash News is calling it quits after 30 years. They are claiming they were ahead of the curve before Art Bell was talking about aliens and Bigfoot. They also claim to be the ones who made Ray Wallace famous. Below is an excerpt from the AOL news report. "We redefined news prep by offering contact numbers to celebrities and to the characters we interviewed," Glynn said. One of these so-called 'characters' was Ray Wallace, a man from Toledo, Wash., known as "the Father of Bigfoot" after he allegedly saw the hairy creature in 1958. Glynn interviewed him many times over a 22-year period before Wallace died in 2002. As a result, Wallace was also interviewed by hundreds of other radio stations, TV shows and print media. "When he died, The New York Times did a story on him," Glynn said. "Without FlashNews, he would have been remembered by a few Bigfoot researchers and the folks in Toledo, Wash. He had fun with it. When I called, his wife, Ulna, would say, 'He's not here,' and Ray would say, 'Now, Ulna, don't be saying that,' and he'd get on the phone." Glynn points out the Flash -- as the staff referred to it -- wasn't just ahead of the curve on Bigfoot. The agency also reported on extraterrestrials long before Art Bell and the History Channel -- disseminating and popularizing much of the information that has become accepted as E.T. lore. "At the time, we were owned by Copley Press, a very conservative news organization," Glynn said. "My bosses used to get calls from the Washington bureau claiming that the D.C. radio stations didn't want any of the 'serious' stories they were doing because they'd rather talk about Bigfoot and aliens." When we say last supper we don't really mean final supper. We mean, what did he eat last night? 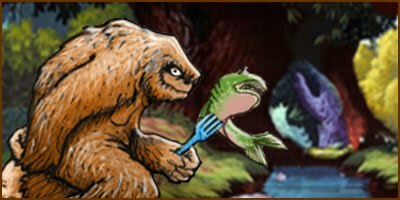 We are big supporters of Sasquatch eating a steady diet of fish as in our post titled Fish Food is Brain Food. • Sasquatch looks a lot like a human. • They have been observed eating many food items that appeal to man and even some that are not so appealing. • They hunt animals and gather fruits, vegetables and nuts. • They are known to be opportunistic, as they have been seen removing dead or wounded animals like deer off our roads and highways. • Many eye witness reports have domesticated animals such as cats, dogs and smaller farm animals like chickens being taken by Sasquatch. ...We can safely answer the question: What does Sasquatch eat? 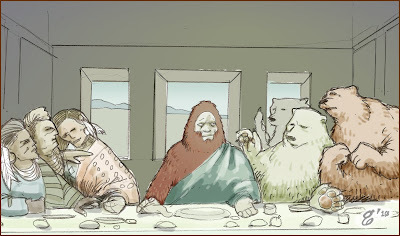 Sasquatch eats what the grizzly eats and probably eats what the Native Americans have eaten in the past and more. These guys did their research, easily building the argument with nutritional facts and the likely availability of different protiens. Another reporter from the Deseret News manages a blog for the paper. His post seems to be from the perspective of an outside spectator. I wasn't surprised by the stories told at the event's microphone, as I had heard most of them before. However, I was amazed at the reaction of the crowd. As I walked around the crowd, I couldn't hear any party goers scoffing in unbelief at the stories being told. There may have been some such people there, by they weren't easy to find. As I talked to 4 random people after the event was over, they had nothing negative to say about the stories given. 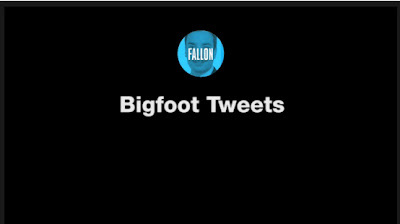 In fact, one of the four people told me her own bigfoot experience. So. there must be a lot of people out there with strange stories to tell, but still fearing ridicule. Above: A shot of a few of the 400 attendees. 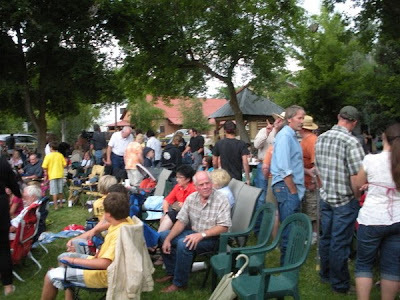 The Deseret news reports on a Bigfoot gathering in Huntsville Utah. Below is a few brief excerpts from the article. "HUNTSVILLE, Weber County — If Sasquatch, alias "Bigfoot," exists, does he have a permanent address in the Ogden Valley area? Purported sightings of a strange creature fitting the description of Bigfoot date back to at least 1968, and interest in the elusive beast has never been higher here. Jay Barker of North Ogden said he operated the Cold Springs Trout Farm in North Ogden. Soon after, he said, one his neighbors spotted a creature — fitting the Bigfoot description — running off with one of his smaller pigs in hand. "Bigfoot apparently can't be killed, and he likes fish and pork," Barker said. After the tale telling Monday night in Huntsville, Ogden resident Rob Alley said he thought it was enlightening "I enjoyed the Bigfoot show," he said. Carver's already talking about a "Bigfoot 2" show. "The Bigfoot program took a life of its own." 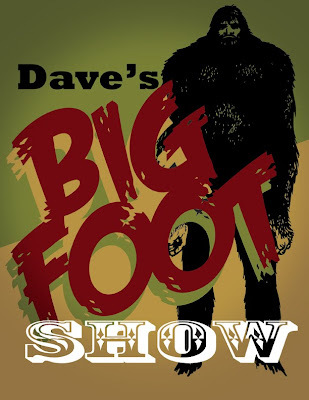 He posts assorted Bigfoot information on a blog at www.davesbigfootshow.blogspot.com. About 20 people, likewise Bigfoot enthusiasts, attended a similar event in 1997, held in nearby Eden. The first reported sighting of a Bigfoot in Ogden Valley dates back to the summer of 1968, when a woman living in Wheeler Canyon might have seen the creature." Dave's blog seems fairly new, but he does seem to be interested in the "Bigfoot as Cain" phenomenon. We have two post regarding the idea ourselves in a post titled Bigfoot Descendant of Cain and IS BIGFOOT MY BROTHER'S KEEPER? 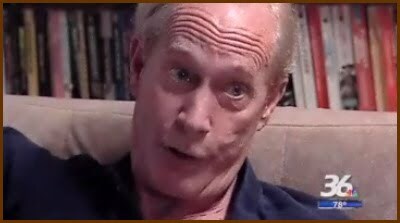 His blog has three links regarding Cain, son of Adam. The Bauman story as related by "Rough Rider" Teddy Roosevelt is a familiar one to seasoned Bigfooters. The St.Petersburg Times allows us to revisit it. 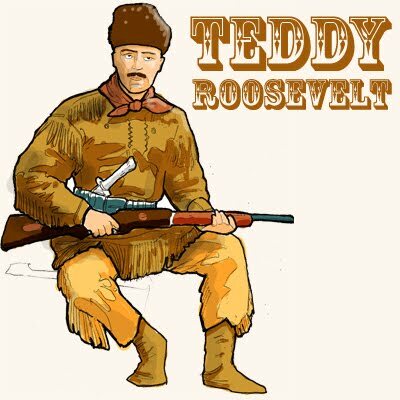 Q:Is it true that President Teddy Roosevelt once claimed to have seen a Bigfoot-type creature? A:It doesn't appear that Teddy Roosevelt ever saw a Bigfoot, but he wrote about another hunter having an encounter with one in his book, The Wilderness Hunter, which was published in 1893. Roosevelt related a story told to him by a "grizzled, weather-beaten old mountain hunter, named Bauman" that occurred near the Salmon River between Montana and Idaho. 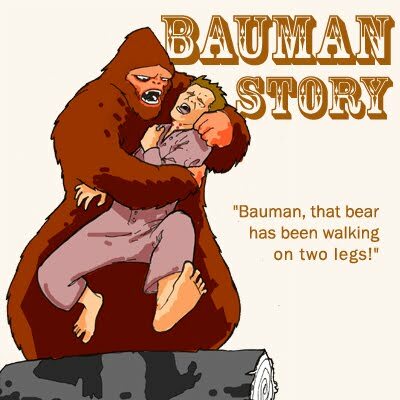 According to the story, Bauman and another man were hunting and trapping beaver when they learned they were being stalked by a creature they thought to be a bear. Roosevelt writes the creature ransacked their camp while they were gone, and the next day, while Bauman was away, it broke his companion's neck. "Bauman, utterly unnerved and believing that the creature with which he had to deal was something either half human or half devil, some great goblin-beast, abandoned everything but his rifle and struck off at speed down the pass . . . until beyond reach of pursuit," Roosevelt wrote. Tomorow at 6:00am The morning crew at 93.3 will be interviewing Billy Willard. Below is a exerpt from their blog. Keep your eyes open for a 10-13 foot tall walking fur ball known as Big Foot, Sasquatch, or Walking Carpet around the Lake Anna Area. 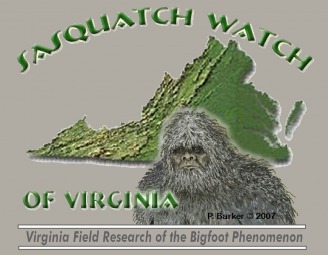 According to Billy Willard (Sasquatch Watch of Virginia) that's where some reports have come in that people have seen the elusive beast. Mr. Willard says "We believe we may be close to some kind of major discovery" referring to some type of evidence that Sasquatch does exist. What type of evidence? You'll find out in the interview with Mr. Willard on Tuesday (7/23/10) in the 6 o'clock hour where we get some answers, and get some suggestions on what to do if we see that "Walking Carpet". For more info you can go to his website - CLICK HERE NOW to go there. Below is an exerpt from a page on Bigfoot Encounters titled "Many Names, Alaska's Bigfoot" which contains an article written by Mary J. Barry, author of Alaska's Ghosts, Enigmas, Outlaws and Things That Go Bump! It should be noted that the Kustaka is more generally described as an otter-like creature. In fact according to Wikipedia, Loosely translated, kushtaka means, "land otter man". The monkey-like description below is unique to Mary J. Barry's article. To learn about the classic version of the Kushtaka, please read the Wikipedia Page. John Active, a Yup'ik storyteller from Bethel, has gathered a large number of accounts told by the Yup'ik people of Southwest Alaska concerning their encounters with Urayuli. This being was described as standing ten feet tall, covered with hair, with glowing eyes. Its arms were so long, they reached to the creature's ankles. It was said to roam the tundra and cry out its loneliness with a voice resembling that of a loon. 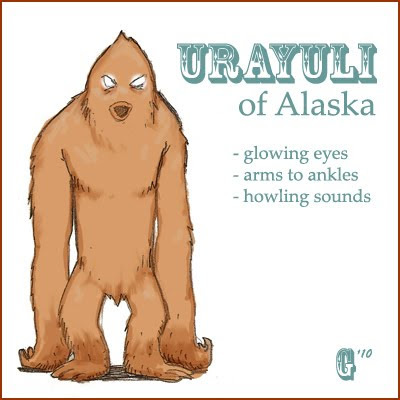 Although its appearance terrified the persons confronting it, the Urayuli never harmed anyone, according to the accounts gathered by Active. 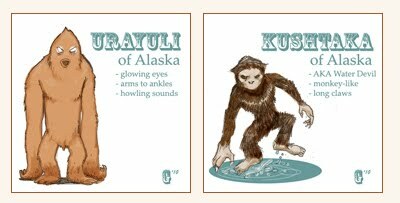 However, legendary accounts lore has it that children who disappear while in the woods are transformed into Urayuli. The Southeastern Kushtaka has a less benevolent reputation. The Natives feared the creature and avoided its habitat. Harry D. Colp described a miner's encounter with the Kushtaka, in an account, which was later published as "The Strangest Story Ever Told." Colp and three other prospectors teamed up in 1900 at Wrangell. They sent Charlie, one of the four, to Thomas Bay to look over a gold prospect, while the others sought grubstakes to pay their expenses. Charlie went about 50 miles up the coast to this location. There the rains kept him confined to his tent for several days. He then went out, trying to locate the landmarks given to him by an Indian. By chance, he found a gold-flecked quartz ledge and loosened a piece with his gun, breaking his gunstock in the process. As he was taking his bearings, he said, a troupe of creatures he called "devils," that looked like both men and monkeys, swarmed after him. These shaggy beasts, with long, coarse hair, stinking and covered with sores, pursued him back to his canoe. During the chase, they screamed and scraped his back with "long claw like fingers." 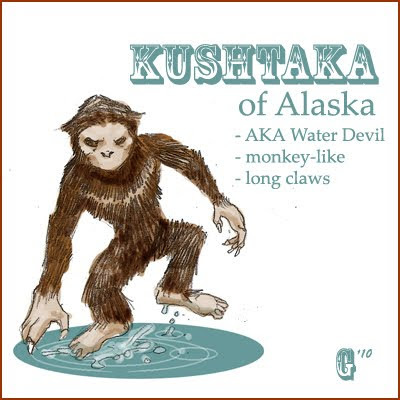 2005: Alaska's Bigfoot: Creature of Lore or Reality? That's what they are calling it, they are using adjectives like messy and calling reaction melodramatic! From blogs such as Cryptomundo,Ghost Theory and Bigfoot Books. 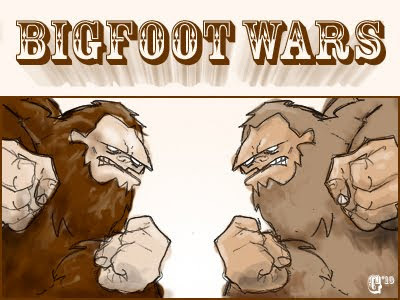 Its a BIGFOOT WAR-ar-ar (cue echo effect). Were not trying to be sensational, but the difference of Bigfoot opinion has been in the forefront of many high-profile Bigfooters. It is a convoluted story and we are not a blog for length. 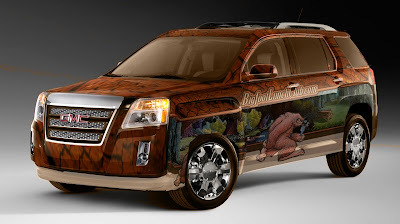 We are more like: get in, feed your Bigfoot news appetite, get out. Yum, yum. Thankfully someone took the time to explain the whole thing in a little over 10,00 words (10,191 to be exact). At Bigfoot Book's Bigfoot Blog they cover the WHOLE thang. From The Mr. Mike Debacle, CryptoMundo Demise?, BFF Insurrection, Outing the Bigfootery Enquirer, and even Lenny Green's Wildman Songs. We have a nifty machine that takes a whole bunch of words and tries to summarizes them. Below is the result of that. I don't know if it does it justice, but here is a an automated summary Of the post at Bigfoot Books's Blog. Why all of these Bigfoot Wars??? Can't prove Bigfoot? OVERNIGHT AM, BIGFOOT, AND MR. MIKE: CREATING THE MATRIX OF CONFUSION. Lan Lamphere, the voice said, of Overnight AM radio. First, "Mike"? Was Bigfoot really "FOUND"? “Backyard Bigfoot” Update" the story continues. 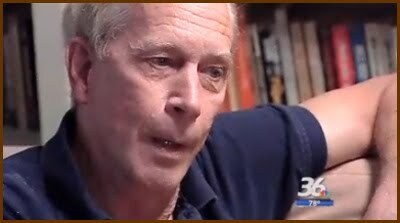 "The Story Continues..." Mr. Mike – Bigfoot – Shocking Story Revealed July 12, 2010 Live. Against BIGFOOT BOOKS themselves. Sharon Lee wrote a piece encouraging Bigfoot folks to "open their minds. 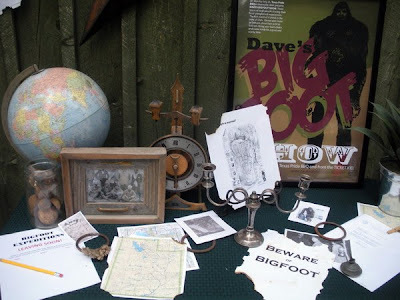 "The Ghost of Bigfoot and Mr. MikeBigfoot Found in North America? We actually lose money on Bigfoot, so there! We swear that was completely automated. 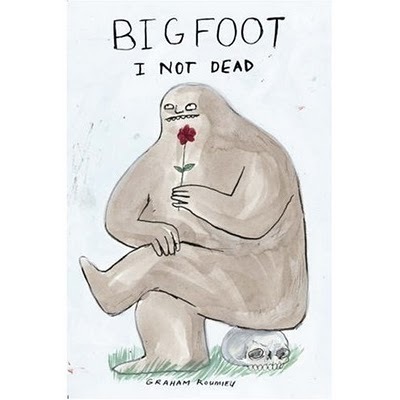 We really recommend getting the full context of the great reporting at Bigfoot Books. Plus read Ghost Theory's untangling of the backyard bigfoot. Legend and reality will meet on Friday, July 23 at the first Bigfoot Bash at the Michigan Magazine Museum, 3309 North Abbe Road, in Comins. The three-day bash will provide a serious study of Bigfoot in Michigan with dashes of fun and live entertainment. Comins is the "heart of Bigfoot country," with 35 documented sightings, said event organizers. Several guest speakers are scheduled to appear during the weekend festivities to share stories of their own Bigfoot sightings. Phil Shaw will lead the stream of guest speakers at 11 a.m. on Saturday, July 24, with a presentation on the historical and amusing side of Bigfoot. Shaw graduated from Michigan State University with a Bachelor's degree in science. At 1 p.m., architect Sanjay Singhal will share his childhood stories of seeing Bigfoot in South Dakota. Singhal graduated from the University of Illinois with a Bachelor's degree in architecture. He also has a Master's degree from the University of Notre Dame. The event will also include presentations that featuring unpublished sighting reports and rare audio recordings. For more event information, call (989) 826-3169. Cryptomundo: Michigan BF on the move? on Late Night with Jimmy Fallon a very Bill Richardson–looking Horacio Sanz discusses what it's like to follow Bigfoot on Twitter. Its about a minute and 13 seconds into the video. How do you beat a fiberglass castle maze, 50 ft mechanical dinosaurs, or stone henge made out of foam (foamhenge)? 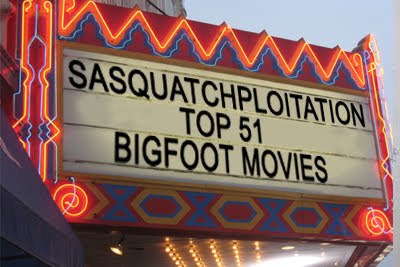 You buy 40 wigs at Wal-Mart and create a Bigfoot roadside adventure open to the public. Mark Cline A.K.A. 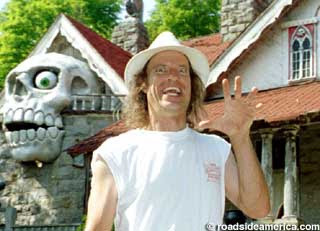 Professor Cline begins to explain why a roadside park with castles and dinosaurs did not satisfy his creative urges. And what was the inspiration for his Bigfoot attraction 40 years later? The result is Mark Cline’s newest attraction, Hunt Bigfoot with a Redneck. As Mark describes it, the attraction is an exercise in “adventure storytelling,” with lots of bad puns and monsters thrown in. Visitors meet the redneck outside his trailer in the woods. The redneck says that he and his kin have lived in harmony with Bigfoot for years. But now his singing Big Mouth Billy Bass is missing, and he intends to hunt down Bigfoot to get his fish back. The hunting trail leads past several “redneck urban legends,” according to Mark, including a crashed flying saucer and a hermit Elvis. 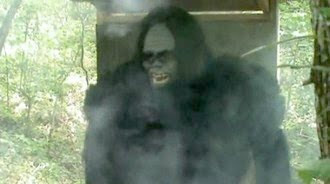 Bigfoot is finally spotted inside an outhouse and blown up with dynamite. Directions: I-81 to the exits for Natural Bridge, then follow US 11 into town. At the junction of Hwy 130 and US 11, across Hwy 130 from the entrance to the Natural Bridge attraction. 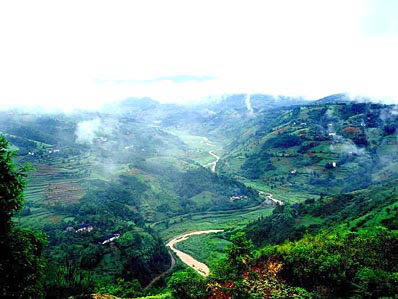 Above is a view of the Hubei province in China. Today, an English-written Chinese newspaper briefly reports the sighting of a sasquatch-like creature. This is a hot area that had many sightings back in 2003. BEIJING, July 19 (Xinhuanet) -- Bears or Bigfoot? That's what villagers in Shennongjia, Hubei Province are wonder-ing ever since one man named Ding Fei, 33, found mysterious thick curly hairs with transparent roots on July 9 at a location called Swallow Hole on a local mountain. After Ding reported his discovery to the neighborhood committee, some professional researchers found additional hairs and a 30-centimeter-long footprint at the same place on July 11. According to their research, the hair isn't human or livestock, but the possibility of bears could not be ruled out. Bobbi Short at Bigfootencounters.com has great reports back-to-back of the 2009 incident in the same areahere. A new scientific paper supports the notion that the oily lipids in fish are necessary to, literally, lubricate the brain of an intelligent primate and as far as we are concerned that includes Sasquatch. The Bigfoot diet is somewhat a mystery (go figure). We can be pretty certain Bigfoot is not strictly a vegetarian as are his cousins; chimpanzees or gorillas — are almost totally vegetarian. Except for an occasional meal of insects, tiny animals, or turtle, they are herbivorous. 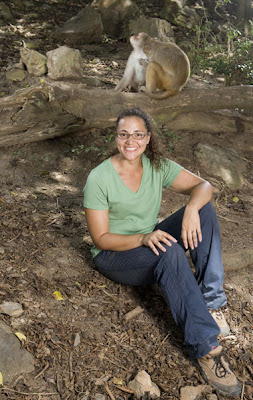 Other large primates have the luxury of diverse vegetation and nuts in their habitat. Bigfoot requires more protein. We have heard reliable reports of Bigfoot chasing herds, even eating small deer, but is this the best way for Sasquatch to get protein? The kind of protein needed for an intelligent bipedal ape? The new paper suggest Bigfoot, being an intelligent hominid would need a steady diet of fish to lubricate his brain. "...it is the nutritional content in the tropical fish that helped human brain development. This helped increase intelligence enough for them to fish more often and more successfully. And for the growing human baby, the nutritional content in fish becomes vital to increase and maintain a high brain:body ratio. It sounds like the movie will be made by democracy, which should be interesting in its own right. 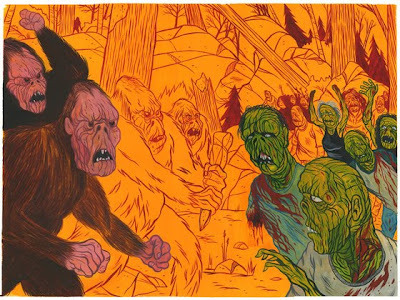 Fans will be able to donate and pick who wins in the epic battle between Bigfoot Vs. Zombies. “We are setting out to make the film that we think the fans would want to see in this situation, we don’t want to settle for some half assed human element in this battle, and that’s what a studio would make us do. We think the fans want to see a feature length film that really delivers on what the title suggests. We are promising a film that delivers on that title from the start to the gory end,” says co-writer/director Andy Davis (2, Adelle, Monster in the Woods). The fans of the genre will decide if this film gets made by putting up their own money, and offering their own thoughts on everything involved in the film from the look of the creatures to the storyline to weather practical effects will be primarily used or CG. 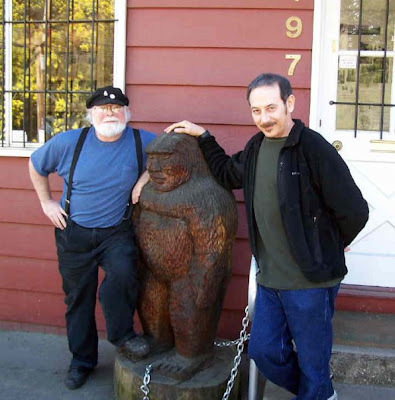 Above is a picture of Mike Rugg of the Bigfoot Discovery Museum and Paul Ruebens of Pee-Wee Herman fame. Mike Rugg posted a video today on his YouTube Channel of a encounter he has been working on for a couple of years. There are two striking things to us. One, the witness is a bicyclist who often camps in the same areas. Time and time again we have heard from the likes of Autumn Williams of Oregon Bigfoot and Ron Moorehead of the Sierra Sounds Bigfoot Recordings that people with multiple encounters visit the same spot over and over again, eventually allowing Sasquatch to become acclimated to the witness. Two, the other thing of note, is the rise of blonde Bigfoot. Mostly Bigfoot's fur is considered dark brown, cinnamon, or black. What do we make of the North Carolina Man's description of a blond Bigfoot and in Mike Rugg's video of a white haired one? 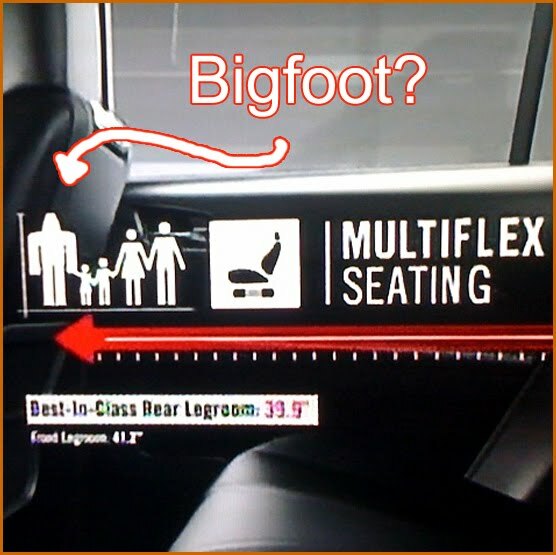 You can find Bigfoot in the video below at about 10 seconds into the commercial. We would also like to suggest GMC pay us for the free advertisement. GMC, you will be thanking us when your You Tube Video gets the BLC Bump and it translates to Selling cars! Better yet, give us a GMC Terrain™ with its impressive EPA Est 32 MPG Hwy and we will call it even. Suburu gave us t-shirts for this post. Plus, we already have a design ready. In an article "Hunting for Bigfoot: Expert stakes out forest" Mike Green is followed as he looks for Bigfoot in North Carolina. The photo above is of Laurie Santos A.K.A. The Monkey Whisperer. With such a title you would assume she may be a primatologist, she's not, She's a Yale University psychologist, and primatologist are listening to her. Her findings reveal that not even 30 million years of Dependant evolution can rewire what is innate within our shared primate DNA. We provide the link to the article below, but there were three unique characteristics that we thought were of interest to Bigfooters. Some of these traits may seem obvious to the seasoned bigfooter, but its always nice to see confirmation from the scientific academic community. The results of Santos observations not only suggested Lemurs payed attention to which direction the experimenters were looking, but were perceptive enough behave differently (like stealing lemons) when they thought they were not being watched. 2. Bigfoot can count and uses those numbers to predict outcomes. Whether counting how many researchers in a team or how many times Bigfoot has seen them, Bigfoot Remembers. Adult lemurs are as good as six-month old baby at adding and subtracting. 3. Bigfoot doesn't have to create a tool to use it. In other words, without history or training, primates were able to distinguish the purpose of tools just by the features they had (i.e. Hammers, screwdrivers, bags, strings). These traits are true for all primates across the board from the primitive lemur to the complex human. 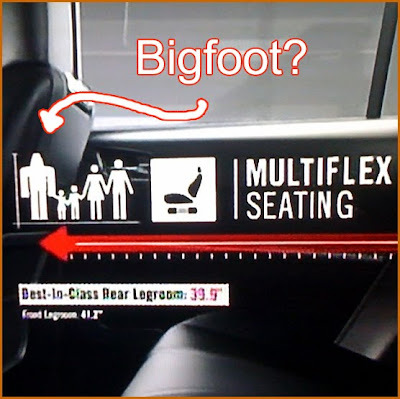 The implications of these behaviors confirm many assumptions Bigfooters have long contemplated. Are people still talking about Enoch? We had tons opinions and many emails and comments requesting us to weigh in, but then we thought better of it. We do, however, think there is still value in using research to discover Bigfoot. For one, we don't all have the benefit of knowing a guy named Mike from Florida. Two, we are as much in love of the pursuit as we are with the eventual proof. That's right, we love the pursuit, the guessing, the pondering and the wondering. So we decided to do something about fostering what WE love about Bigfooting; the sharing of ideas. So here we are, with some neat concept art of Gigantopithecus blacki. The Gigantopithecus blacki skull, introduced to us bigfooters by Dr. Grover Krantz. It is a reconstruction based on a large Chinese male fossil jaw, assuming bipedal posture and ape-sized brain. We always wanted to see a muscle reconstruction and then a flesh one on top, this way we could see the relationship of each layer. Things we noticed are lack of forehead muscles, theres no room for them. 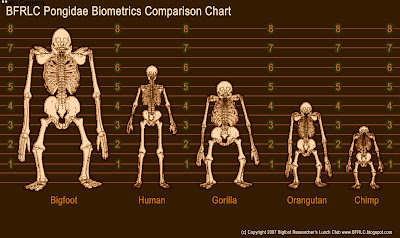 We were also were very surprised how it really was really "in-between" human and ape. Most art we see is either to far in one direction, this concept, we thought, struck the balance between the two. Share your thoughts, tell us what you think we got right (or wrong) and share what you would like to see next. 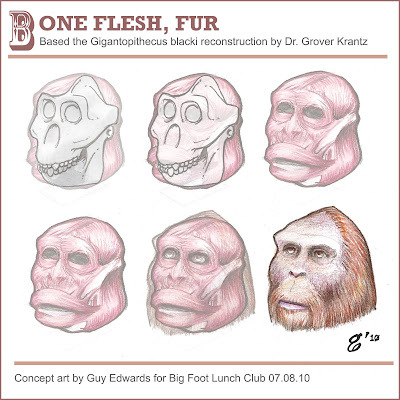 Gigantopithecus blacki: bone, flesh, fur by Guy Edwards is licensed under a Creative Commons Attribution-NoDerivs 3.0 Unported License. 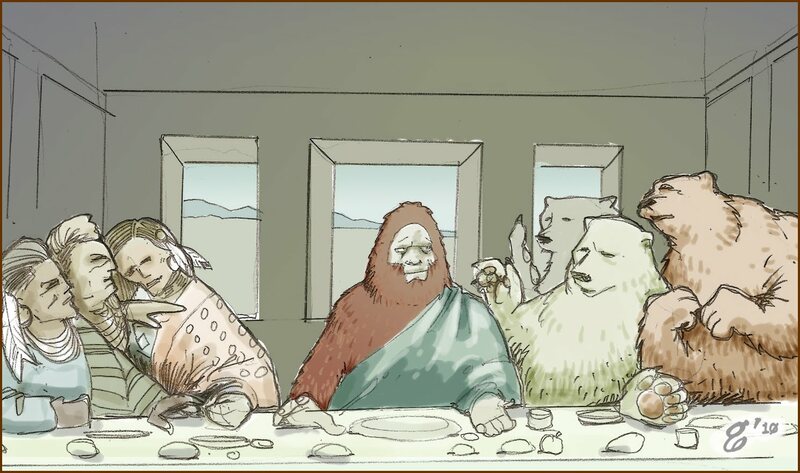 Based on a work at www.bigfootlunchclub.com.com.